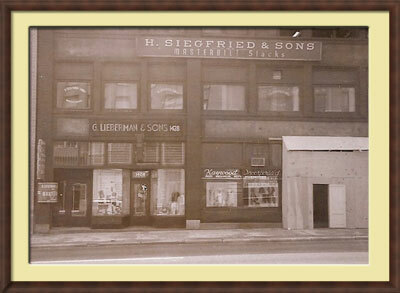 We recently discovered some old photos taken of the original G. Lieberman & Sons in downtown St. Louis, Missouri. These first three photos were taken about the same time in October 1961. The first one shows the exterior of G. Lieberman & Sons, "GLS", 1428 Washington Ave. 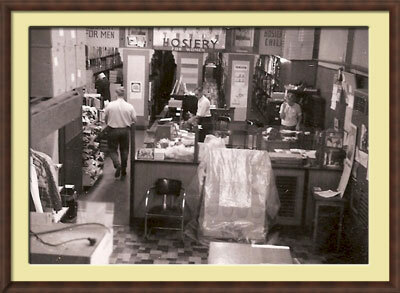 It occupied part of the lower floor of a building which housed H. Siegfried & Sons, manufacturer of "Masterbilt" Slacks. 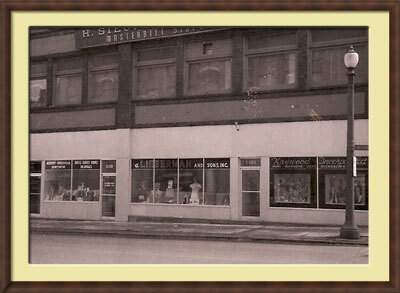 Next door to GLS was Kaywood, Incorporated, seller of "men's neckwear, belts, and accessories. 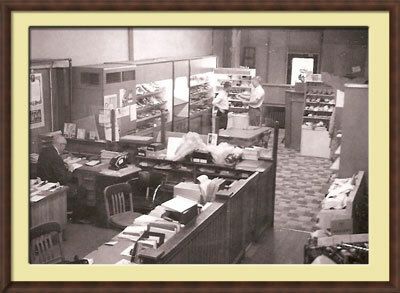 Interior view of office, with showroom in back Seated at the desk to the left is Frank Lieberman, son of founder G. Lieberman and grandfather of the present owner, Steven Katz. A different view with the showroom in the foreground, looking back at the office area. Several employees are shown. Along the back wall, on the left it says "Hosiery for Men;" in the middle it says "Hosiery for Women;" and on the right it says "Hosiery for Children." The next two photos show the exterior after a remodeling in the winter of 1962. New, brighter paneling was installed around the windows, and GLS expanded to occupy the show window formerly used by Kaywood. 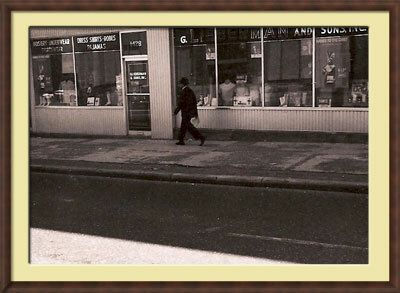 In the windows on the left side it says "Hosiery, underwear, sportswear, dress shirts, robes, pajamas." This picture was taken sometime later than No. 4. The entire right show window is devoted to the venerable Hanes brand products. This is a panoramic view (two adjacent photos) of the remodeled office area, showing two female employees and an enclosed office. The room now has bright paneling, but the furniture is the same. 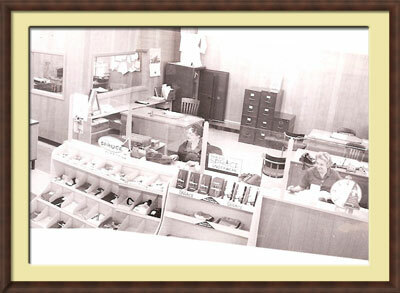 The calendar on the wall shows March 1962, and on the back wall above the file cabinets, "22" is readable, so that may be the exact date. In the foreground there are bins displaying "Mayo Spruce Underwear." 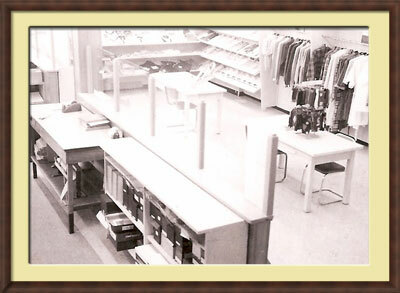 The brightly remodeled showroom in the back with bins and racks of clothing. A shelf of catalogs or maybe order books and a package wrapping table is on the left. 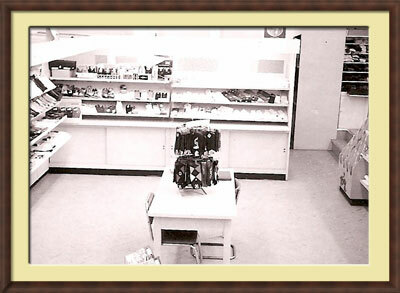 Another view of the showroom from a different angle showing bins of socks on the left and underwear on the right. A display of what appears to be pantyhose or stockings is on the table in the foreground. Photos courtesy of Evelyn Lieberman.